Read the Bible: How to Really Enjoy Reading the Bible! How to Really Enjoy Reading the Bible! Do you regularly read your Bible? Do you really find joy in your reading? How can you read with excitement? Read the Bible! “Enjoy reading the Bible?” you may ask. Yes, you can and should find deep enjoyment, satisfaction, and fulfillment as you go to your Bible each day to receive from the Lord–who is the ultimate “author” of His divine Word. Every sincere Christian wants to read God’s Word, the Bible, and each one has heard again and again the importance of being a daily Bible reader. However, too often people don’t find the deep satisfaction that reading the Bible can give. They want to enjoy God’s Word but sometimes find that they must force themselves to read on a daily basis. They feel obligated to read, although they may not really want to read. I have good news for you! The Bible can be enjoyed! You can have the deep pleasure and fulfillment of reading the Word of God if you really want to. Jeremiah found great joy in God’s Word. He prayed, “Your words were found and I ate them, and Your words became for me a joy and the delight of my heart” (15:16). While we may not literally “eat” God’s Word, we can find joy as we spiritually consume that Word! Consider also the well-known 119th Psalm. How did the writer describe his response to the Bible? He said, “I delight in Your commandments, which I love” (v. 47). Do we love and delight in God’s Word as he did? He continued, “O how I love Your law! It is my meditation all the day” (v. 97). Do we love and meditate on God’s Word every day and all the day? Note further: “How sweet are Your words to my taste! Yes, sweeter than honey to my mouth!” (v. 103). Do we find the sweetness of God’s Word as we read it daily? The psalmist continued, “I love Your commandments above gold, yes, above fine gold” (v. 127). He knew the value of God’s Word–and you can too! He went on to write, “Consider how I love your precepts. . . . I love your law. . . . Those who love Your law have great peace, and nothing causes them to stumble. . . . My soul keeps Your testimonies, and I love them exceedingly” (vv. 159, 163, 165, 167). I ask you this question: If the psalmist had such pure delight in the Law of God (the Law of Moses), shouldn’t we have even more joy in reading and consuming the full revelation of God’s Word in all of Scripture–all sixty-six books of the Bible? And shouldn’t we find great delight especially in learning of the gospel (good news) of Jesus Christ, found in the New Testament portion of the Bible? 1. Grow in a love relationship with the Author of Scripture. If a young woman received a “love letter” from her fiancé, she would eagerly read it since she is in love with the letter’s author. She would read and re-read those precious words, reading “between the lines” to discover the full richness of her lover’s message. Similarly, if we love God, we will find delight in the inspired words of God! “With all my heart I have sought You; do not let me wander from Your commandments. Your word I have treasured in my heart” (Psalm 119:10-11a). Love God and love His “love letter” to you–the Bible! 2. Have a personal relationship with God. We’ve seen the importance of loving God, the Author of Scripture, if we are to understand His divine Word. But even more basic than this, the reader and interpreter should truly know God through Jesus Christ the Lord. You should have a deep and intimate relationship with God who inspired Scripture through the Holy Spirit (John 17:3; 2 Timothy 3:16). Along with this, it is vital to remember that joy comes through the work of the Holy Spirit in our life (Galatians 5:22), and the only way to experience this is to receive the Holy Spirit Himself through repentance and faith (Galatians 3:2, 5; Acts 2:38-39; 5:32). If you want to have true joy in your Bible reading, you need to give the Spirit full access to your life by faith and obedience. If you truly know God, in Christ Jesus and through the Spirit, you will be so much more prepared to rejoice in your Bible study. 3. Make Bible reading your priority. Each of us has an array of responsibilities and activities in life that fill our days and nights. Some of these may be considered important, such as eating, sleeping, working, bathing, as well as relating to our spouse and children. God knows that some of our priorities should be fulfilled. However, we also know that spiritual priorities should be at the top of our list. Jesus declared, “Seek first His [God’s] kingdom and His righteousness” (Matthew 6:33a). When we read Scripture devotionally, regularly, seriously, and intensely, we are seeking God’s kingdom and righteousness first. This should be considered primary in life as we press on toward the goal of heaven with God! This means that our devotion to reading God’s Word and allowing God to “speak” to us through its pages must receive our ultimate allegiance and the choice placement in our daily responsibilities. 4. Remember that God is speaking to you as you read. Many people think that their Bible reading is nothing more than an intellectual exercise to garner facts. It is far more than this! God “speaks” to us as we read. Scripture says, “Today if you hear His voice, do not harden your hearts” (Hebrews 3:7-8). Jesus says, “He who has an ear, let him hear what the Spirit says to the churches” (Revelation 2:7). What we read is what we “hear”! Let’s be open to God’s own words as we read. Let’s have the attitude of the song, “Lord, speak to me that I may speak in living echoes of Thy tone. . . . ” Let me ask you, “If God personally, audibly spoke to you, would you be joyful?” Indeed God does speak even though we don’t hear him audibly and literally. Rejoice in this privilege! 5. Approach your Bible reading with worshipful awe. It is vital that you have a proper attitude and frame of mind and heart as you open the pages of Scripture. For example, God says, “To this one I will look, to him who is humble and contrite of spirit, and who trembles at My word” (Isaiah 66:2b). Here we see that the one who comes to the Word should have a humble, contrite, and fearful (or respectful) attitude. We’ve seen earlier that we come with a love for God (Scripture’s Author) and a love for His Word (Psalm 119:47, 127). Remember that the Bible is actually God’s Word! You should approach it with a worshipful attitude, a fearful and respectful attitude, a submissive and yielding attitude, and a love for the God of Scripture. 6. Consider it a amazing privilege to read and study Scripture. Until about the year 1500, the common person didn’t have the Scriptures in his own language. It took centuries before the Bible was translated and circulated in many of the world languages. Today, you have a priceless gift in your hands! You can read the Word of the living God and understand the Scriptures yourself, apart from false religious leaders censoring what you read! With this privilege comes tremendous responsibility. 7. Choose to read those portions of Scripture that are more relevant to your situation. We know that “all” Scripture is inspired of God and is profitable to us (2 Timothy 3:16-17). But some portions may speak to you more directly. Some books of the Bible are plainer in their presentation of the gospel of Christ. Some portions of the Old Testament present the Old Covenant regulations which were given to Israel, but the New Covenant writings are meant for people today, both Jew and Gentile. Many readers have found such books as Matthew, John, Acts, Romans, Ephesians, Colossians, Philippians, James, 1 Peter, and 1 John to be especially helpful. You may want to constantly read these and major on them (while not omitting the others). Rejoice with this privilege! 8. 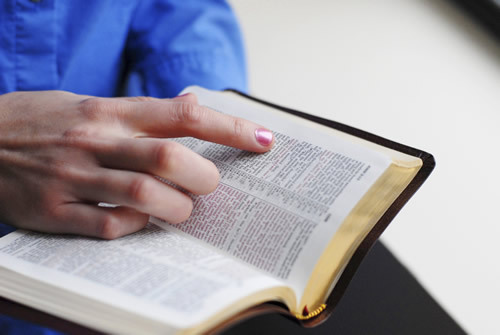 Choose a trustworthy, accurate, readable Bible translation. One’s desire to read the Scriptures with understanding is defeated by using an archaic translation. For instance, the King James Version, an older yet popular translation, uses at least 450 outdated words that people today have great difficulty comprehending. Some of the words are actually misleading or incomprehensible. Choose a translation that is very faithful to the Hebrew and Greek originals and conveys the original meaning in todays language. 9. Choose a good edition of your Bible translation. One thing that can make reading difficult and a struggle is to try to read print that you can hardly see. Recently I was in a Dollar Store and checked out the Bibles that they sold. The print was tiny, the format was hard to read, the columns were narrow, and all of this made it difficult to read. Invest in a very good edition that has a size of print large enough that you can read the words without strain or fatigue. Recently I found an edition with somewhat larger size type and it invites more Bible reading and study! Some have found that marginal chain references, study notes, and maps are helpful, along with the words of Christ in red letters. 10. Develop a real interest as you read a portion of Scripture. Some people complain that their reading is dry and boring. It need not be this way. Develop a captivating interest in what you are reading. Ask yourself: “Why did Peter deny Jesus in this passage?” “Why did the Pharisees react so vehemently against Jesus as He declared His relationship with the Father?” “What was the nature of Judaizers that Paul seems to regularly combat?” Also, notice the choice of vocabulary, the connection between sentences, and the development of the argument in each book. This will arouse your curiosity, awaken your interest, and give you the joy of Bible discovery! 11. Practice “Reality Reading.” This it the term I use to refer to reading with the knowledge that the Bible is absolutely true. When Scripture says that Jesus walked to Capernaum or Nazareth or Nain, this is exactly what happened. When it says that Jesus was in a boat on the Sea of Galilee, or that he talked to a Samaritan woman, or that He taught in the temple, this is precisely what happened. As you read Scripture, remember that these accounts are real, accurate, and historical. In your mind, try to picture the leper as he says to Jesus, “Lord, if You are willing, You can make me clean.” Then imagine Jesus stretching out His hand and saying, “I am willing, be cleansed.” Then note that Matthew mentions the outcome: “Immediately his leprosy was cleansed” (Matthew 8:1-3). Let the Bible “come alive” to your heart, for “the word of God is living and active, and sharper than any two-edged sword,” and is “able to judge the thoughts and intentions of the heart”(Hebrews 4:12). Try reading every chapter, paragraph, sentence, phrase, and word with the firm conviction that these events actually happened and these words were actually spoken. You are not reading to please the preacher, to fulfill a Bible reading guide, or to live up to your own expectations. Rather, you read to please God and to understand the truth of His Word. You read to better your grasp of the will of God so you can believe it and obey it. Let the Word “speak” to your mind and heart as you read! It will transform your boring reading into an exciting adventure! 12. Look for interesting facts and valuable truths. The truth of God is as old as the Bible, but it may be new to you. The Bible is a gold mine, and you are digging for precious gems! The Bible is a storehouse of treasure and you seek to discover all you can. There is true joy as you learn more and more from God in His Word! Solomon wrote, “If you cry for discernment, lift your voice for understanding; if you seek her as silver and search for her as for hidden treasures; then you will discern the fear of the LORD and discover the knowledge of God” (Proverbs 2:3-5). Notice the interest, involvement, and devotion that this kind of Bible reading demands! 13. Ask the Lord to give you true joy as you read the Scriptures. We know that spiritual joy is the fruit of the Holy Spirit (Galatians 5:22-23; Acts 13:52) that comes through Jesus Christ (Philippians 4:1). Ask God to stimulate this joy in your heart as you open yourself to His divine Word. I once read a book entitled, The Joy of Discovery. The main point was that we can rejoice as we learn new things, discover fresh insights, and make relevant applications to our own life and circumstances. 14. Read the center column notes and use the references. The notes should help with alternative readings, identification of place names, and perhaps make brief explanations. The references will offer thousands of other Biblical passages that can help to elucidate the text that you are reading. Check out what the various authors wrote in parallel passages. 15. Find a quiet place and time to read the Scriptures. 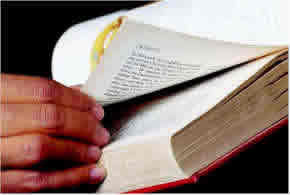 You should be undisturbed in your reading so that you can think through the text as you read it. Don’t allow background noise, music, TV programs, or conversations to disturb your concentration. Even a crying baby can interfere with your focus on the text. Find a time when you can be alone and also a time when you are most awake and alert in your reading. For some, this may be at 5 AM and for others it may be 10 PM, while for others it may be lunchtime or some other time during the day. 16. Spend sufficient time to devote quality time to reading. Some people open the Bible and try to learn something in a mere two or three minutes of reading. While nothing should be discounted, generally it will take much longer to get into the mood and frame of mind for truly connecting with God’s Word. Aim for fifteen or thirty minutes at the least. Some have found value in concentrated reading and study that might last for an hour, two hours, or longer. When we really enjoy an activity, it is hard to pull us away from it! 17. Try to be rested as you begin your reading. Sometimes it is hard to get enough sleep since we try to do more than we have time to do. Try to be as rested as possible. One of the ways we may defeat our Bible reading is by being half-awake, drowsy, or exhausted. It may be good to physically exercise before your study in order to stimulate your circulation and alertness. It may be helpful to have a shower first. Drink water as you read. Splash cold water on your face to keep yourself alert. Try to be as refreshed as possible to better enjoy your experience. 18. Begin your Bible study prayerfully. Before you begin to read the chapter or chapters for the day, pause to ask God’s blessing on your reading, the clarity of your thought, and the conviction that the Spirit brings through the Word that He inspired. The psalmist prayed, “Open my eyes, that I may behold wonderful things from Your law” (Psalm 119:18). Don’t just rely on your reading ability; depend on God to enlighten you as you prayerfully read. 20. Read the Bible methodically. Read each book you are studying, read each chapter, read each sentence or verse, read each phrase, and read each word. You may want to read to understand a book of the Bible, or you may want to read to better understand a given teaching (or doctrine) of Scripture. It is better not to just open the Bible and start reading where it falls open. Be more methodical and systematic rather than careless in your studies. 21. Read for understanding of the message. Look up the words in an English dictionary or a Greek lexicon if you don’t know their meaning. Notice how the phrases of the sentence combine to give the meaning. Notice the grammar and syntax of the sentences. God will help you in this holy desire. Paul wrote, “Consider what I say, for the Lord will give you understanding in everything” (2 Timothy 2:7). 22. Ask questions as you are reading. You might want to regularly ask the common questions of what, where, when, why, how, and who? Ask: Who is speaking and to whom is he speaking? Why did Mark write his gospel? Why did Paul write to the Corinthians? Who were the Pharisees and Sadducees? Where were Philippi, Antioch, Ephesus, and Caesarea? Who were Peter, Silas, Barnabas, and Lydia? What was the nature of the false teaching in Colossae? Who were ‘s opponents at Corinth? This should help you to maintain high interest as you are reading. 23. Use all of the Bible study aids that you can locate. It would be good to invest in a good Bible concordance for your particular translation. A Bible dictionary would be a helpful investment for defining the terms that you will find in your reading. Some have found a Bible atlas to be an aid in locating cities, mountains, and rivers on the maps of the Bible lands. This can help you to understand the text you are reading. Some readers use a notebook to record their discoveries; this will help you to locate the results of your studies at a later date. Perhaps you might want to use a journal, a book to write your informal comments and prayer statements. All of these helps or aids may stimulate your joy in Bible reading and study! 24. You may want to have a partner in your reading. If your spouse or your brother or sister in the Lord is reading the same portion, you may be able encourage (Hebrews 3:13) or stimulate (10:24) each other in your spiritual quest. Ask questions of each other. Tell each other what you have discovered in your daily reading. Discuss the meaning of the Bible passage. Memorize key Bible verses together. Encourage each other! 25. Read the Bible to prepare yourself for Christ’s service. One of the chief reasons for your study is to give you knowledge to share the meaning of Scripture with other Christians. You can read with the definite purpose of making yourself adequate as a teacher of Scripture, even if this means only a one-to-one teaching, like Aquila and Priscilla did with Apollos (Acts 18:26). Or it may be that you publicly teach Scripture and this can give you the incentive to read with understanding. Remember that the Scriptures are profitable for teaching, for reproof, for correction, and for training in righteousness (2 Timothy 3:16). 26. Study to prepare yourself to reach the unbeliever with the gospel and instruct those who have been deceived by false teachers. Paul tells Timothy, “Preach the word; be ready in season and out of season; reprove, rebuke, exhort, with great patience and instruction” (2 Timothy 4:2). We need to be prepared: “In your hearts honor Christ the Lord as holy, always being prepared to make a defense to anyone who asks you for a reason for the hope that is in you; yet do it with gentleness and respect” (1 Peter 3:15, ESV). We need to be ready to share the gospel with the lost and correct those who are spiritually confused by false doctrines. Therefore, you need to know the Scriptures thoroughly! 27. Determine to read for spiritual benefit from the Lord. For instance, Paul writes, “Whatever was written in earlier times was written for our instruction, so that through perseverance and the encouragement of the Scriptures we might have hope” (Romans 15:4). Yes, the Bible gives encouragement, but it also gives us warnings (1 Corinthians 10:11), teaching, reproof, correction, and training in righteousness (2 Timothy 3:16). Scripture gives us wisdom that leads to salvation (v. 15). The Word of God nourishes us (1 Timothy 4:6) and helps us to grow (1 Peter 2:2). If you keep the spiritual benefits of your Bible reading in mind, you can develop an unquenchable appetite for the Word. This will bring true joy! 28. Practice both Bible memory and meditation. Commit the truths that you learn to your memory and this will enable you to mediate on the Scriptures at all times, even when you don’t have a Bible available. Jesus said, “If you abide in Me, and My words abide in you, ask whatever you wish, and it will be done for you” (John 15:7). Really seek to allow Christ’s words to abide in you so you can recall them through the day, whether on the job, driving a car, shopping, or conversing with people. The psalmist wrote of the blessed man who is oriented to God’s Word: “His delight is in the law of the LORD, and in His law he meditates day and night” (Psalm 1:2). Notice that he “delights” in the Word and “meditates” on that word at all times. This will contribute to your joy! I hope that your reading the Word of God with merely a sense of duty will soon be gone. Apply these suggestions to your own Bible reading and you will find a fresh interest in what you read. Consider this: “Only those who do the will of God will enter the Kingdom of God” (Matthew 7:21), will receive God’s promises (Hebrews 10:36), and will live eternally (1 John 2:17). The only way to know God’s will so you can obey it, is either to read the Bible for yourself or to learn its teachings from someone else (cf. Acts 8:30-31). As you grow in your sincere faith in God and passionate love for Him, you will come to have a burning desire to read, study, learn, and meditate on His Word. You will come to have a real enjoyment of His Word, a genuine delight in searching the Scriptures, and a spiritual pleasure in understanding and obeying that Word. Dear God, thank you for revealing Your truth by means of Your chosen apostles and prophets who gave us your inspired Word. Help me to love You and love Your Word. Help me to read it, study it, understand it, apply it, and fully obey it in my own life. And use me to communicate that Word to others as You give the opportunity. I thank you for that Word and for Jesus Christ, the Living Word, my beloved Savior. Help me to find true joy as I learn Your truth day by day in my Bible reading and study. In the Lord Jesus’ precious name I ask this. Amen. You may also want to read: How to Read Your Bible!